Former President General (Retd) Pervez Musharraf is all set to file a review petition against the Supreme Court’s July 31, 2009 verdict regarding imposition of emergency 2007 on Monday. According to reports, teams of legal counsellors have been set up to defend the former dictator that will defend Musharraf nationally and internationally. Sources of All Pakistan Muslim League (APML) said that Advocate Ibrahim Satti will file an application against the SC decision. 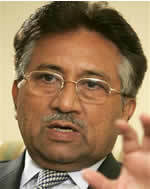 Though belated, the petition will challenge the judgment by a 14-judge bench headed by then Chief Justice Iftikhar Mohammed Chaudhry declared that unconstitutional and illegal Gen Musharraf’s second coup through Emergency Order of November 3, 2007, and most of the actions taken under it, including the appointment of over 100 superior court judges. According to sources, strategy has been devised to lobby for Musharraf in and outside the country.